Learning today that Qualcomm has a market capitalization that is now greater than Intel’s, makes me a bit sad and disappointed in myself. When Les Vadasz and I started Intel’s Corporative Business Development Group around 1991, now known as Intel Capital, we saw it as a strategic vehicle. I had started making minority investment a few years earlier after giving up on the idea of using acquisitions to grow the company. Les and I thought that by investing in early stage companies, Intel would gain insight into the future which would impact its strategic direction. Since our objective was strategic, we would have been happy with just getting a good financial return. Instead we got a fantastic financial return (when I left Intel in 1999, Intel was arguably one of the most if not the most successful venture capitalists). The disappointing part is, as far as I can see, there was no impact on Intel’s strategy for the future and results are clear to be seen now. We did have major impact on the computer industry on the other hand, particularly in the development of residential broadband and consumer Internet. The market capitalization of Qualcomm at more than 100 billion is now higher than Intel’s. This would have been unthinkable in 1991 when I first meet with the founders of Qualcomm, Irwin Jacobs and Andy Viterbi. It reminded me of the time in 1982 when I was a group manager at Digital Equipment Corporation, the second largest computer company in the world, and met the CEO of an early stage company called Compaq. How could I have guessed then that sixteen years later, Compaq would acquire Digital only to be eventually swallowed later by HP ten years after that. I was extremely impressed with the Qualcomm people at that meeting. Les Vadasz, my boss at Intel and badge number three was with me as were a number of other Intel people but I no longer remember who they were. The Qualcomm folks first gave us an amazing tutorial on CMDA (Code Division Multiple Access) the technology they were developing for mobile phones. At that time, cell communication was analog. The primary technology deployed in the USA was called AMPS for Advanced Mobile Phone System. At the same time that Qualcomm was developing CMDA, while another technology was being developed primarily in Europe called GSM. GSM was very successful and is still the primary communications standard for most of the world. Once described as the most beautiful woman in the world, actress Hedy Lamarr was one of Hollywood’s most glamorous silver screen goddesses of the 1930’s and 40’s. But Ms. Lamarr had another talent: she was brilliant. Working together with avante-garde music composer George Antheil, Lamarr came up with the notion that multiple frequencies could be used to send a single radio transmission – a concept that’s now known as frequency hopping. The concept would eventually provide the basis for the CDMA airlink, which Qualcomm first commercialized in 1995. Today, CDMA and its core principles provide the backbone for wireless communications, thanks to the creative vision of one extraordinary woman. At the same Qualcomm meeting, Les and I were briefly introduced to Paul Jacobs the son of the then CEO and founder Irwin Jacobs. Paul was responsible for another part of Qualcomm which was developing an email system called Eudora. I am not sure why Qualcomm acquired Eudora from The University of Illinois where it had been developed. Perhaps, they saw the possibilities of mobile email. Paul Jacobs is now the current CEO of Qualcomm. I was interested in having Intel invest in Qualcomm. As readers of my blog will know, I was always passionate about communications/networking technology. I thought these people were brilliant and had very complimentary technology capabilities. It would also provide Intel with a relationship in the San Diego area where so many communications companies were located also seemed attractive to me. But I certainly did not make the sale at Intel. I am not sure it even got much further than Les Vadasz. It is no longer clear to me why there was a lack of interest. I suspect that it just felt too far away from our core business which at that time was selling microprocessors to manufactures of desktop computers. It might have been difficult for those that understood anything about mobile technology to imagine that CMDA could compete with GSM which had much more support. While CMDA never really beat GSM it allowed Qualcomm to develop its capabilities and to increase its patent position. 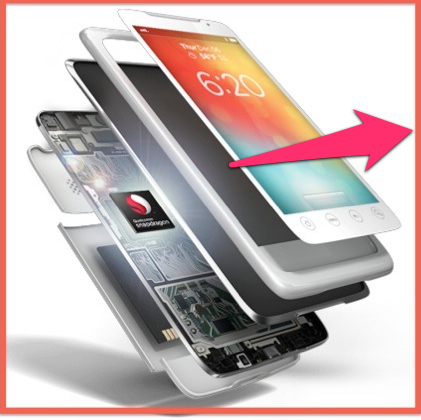 Over time, Qualcomm became the leading supplier of mobile communications technology with customers like Apple. Qualcomm was the 7th leading semi conductor supplier in 2011. In 2005, Paul Jacobs became CEO of Qualcomm, the company his father, Irwin Jacobs founded and led. Since I could not get Intel interested in Qualcomm, I decided to buy Qualcomm stock in its IPO in 1991. Unfortunately, I sold a few years later. The market cap is now a bit over 100 billion. It was about 400 million in 1991. Today, Intel’s market cap is slightly lower than Qualcomm. When I left Intel in April of 1999, the market cap of Intel was $218 billion. At that time Qualcomm was valued at 26 billion dollars or one 10th of Intel’s value at that time. Qualcom market cap was only 4 billion dollars the year before. In the late 90s, there were two companies that Intel should have acquired in my opinion. One was Qualcomm. The other was Broadcom which had a market cap of one billion in 1998. Intel did have an investment in Broadcom of some significance. Broadcom is now worth 17 billion. By owning these two companies, Intel would have the leading position in broadband and cellular communications instead of just owning an aging microprocessor architecture. But instead Intel has done nothing of significance. They have just been milking their microprocessor business. Winning Apple’s Mac business was a major success but Intel was not able to get the more important part Apple’s business which is the i-Devices. I suspect that Apple will replace the Intel microprocessors with their own chips in the next 3-5 years and even the threat of this will put major pricing pressure on Intel. Over the years since I left Intel, I have suggested to some of the Intel executives that they consider acquiring Qualcomm but the response was always, it was too expensive. Well the market has thought differently. If anything, it has thought that Intel was too expensive. So will Qualcomm acquire Intel? I doubt that they will do it. Qualcomm will continue to grow while Intel will eventually end up a semi conductor foundry where Apple and other’s will have their chips manufactured unless they make some major changes. How sad! I am sure that many of my former Intel colleagues will disagree with my point of view but the numbers speak for themselves. Interestingly, if it did happen, the CEO’s first name would still be Paul. Tags: Intel, Qualcomm. Bookmark the permalink. I enjoyed this post alot. Well done. It shows a good company can go brain dead in a short time. Great post Avram. To your ending question about INTC being bought (by QCOM or anybody else) my answer would be “not in the next 30 years”. That seems like a long time but there is something in the DNA of semiconductor companies that makes them soldier on for *decades* after their peak. As you know I have good experience with that having run M&A and Corp Dev at National Semiconductor recently. There is something incredibly resistant (bankers euphemistically call it “social issues”) to sale or combination in the semi world. Less proud semi companies soldier on as cash cows 20 years after they should have been merged with someone else. As you note in the PC industry (and software, etc) combinations took place relatively quickly. In the semi world, it’s different. So I think we can rest at relative ease knowing the flag will fly for a very long time at Intel HQ, long after most people will recognize the brand. Bart, I think you are saying that Intel is the new National Semi. But there is no new, Intel. I guess no one knows now who the leader is in cable (I mean in manufacturing cable). Very interesting…lots of examples of market leaders that listened more to their PR and Marketing than their customers….most young people have not even heard of them….Data General, DEC, Wang, Datapoint, Computer Automation, all which were considered leaders in their markets. When companies are more focused on enhancing their existing products without testing it’s value to future needs, the possibility of joining this select group is possible….Too Big to Fail only applies to Banks NOT technology companies. Who is next? HDD to become a vertical integration component at $10-15B for chip or Cloud companies…..Smart Card companies that have limited storage capacity to less than 1MB, even though GB+ is available, because of installed base of slow readers when Bluetooth is the future of Mobile Devices? Thanks for you post. That is what the blog is for but not many people post. So far I have had about 41,000 plus views and just 388 comments. But I enjoy writing the posts. I hope to get the one about hard disks this week coming up.